ezslots - slots for the masses! For years, the most popular link on my site has been a simple jquery slot machine effect. At the encouragement of a fellow developer (Ron Sparks), I have parlayed that into a proper github project. Maintaining the simplicity was key; there's another similar project that has stolen my google juice thunder, but it's more complex than what I have, so I have worked to Keep It Simple, Silly, so a novice coder can more readily customize it to the effect they want. So, go to the github project see it in action at the sample page. The core function (which is still there) was alright... tapping the title of a song (an h3 tag) opened up the notes associated with it (in a pre tag). The thing was, I linked the h3 and the pre tag via an id naming convention... so for each song header I had to come up with a shortname id, and then pre section it was with had to have the same id followed by "_". Bleh! and I can ignore IDs entirely. I also realized that, despite ordering the headers alphabetically, it wasn't super-easy to locate a song - like I woudn't know if "When the Saints Go Marching in" be under "When" or "Saints", or would "Just a Closer Walk with Thee" be under "Just" or "Closer" etc... and the mobile safari find function isn't particularly smooth to move in this case. Red lines are geared at the uppercase boundaries, blue line for lowecase. 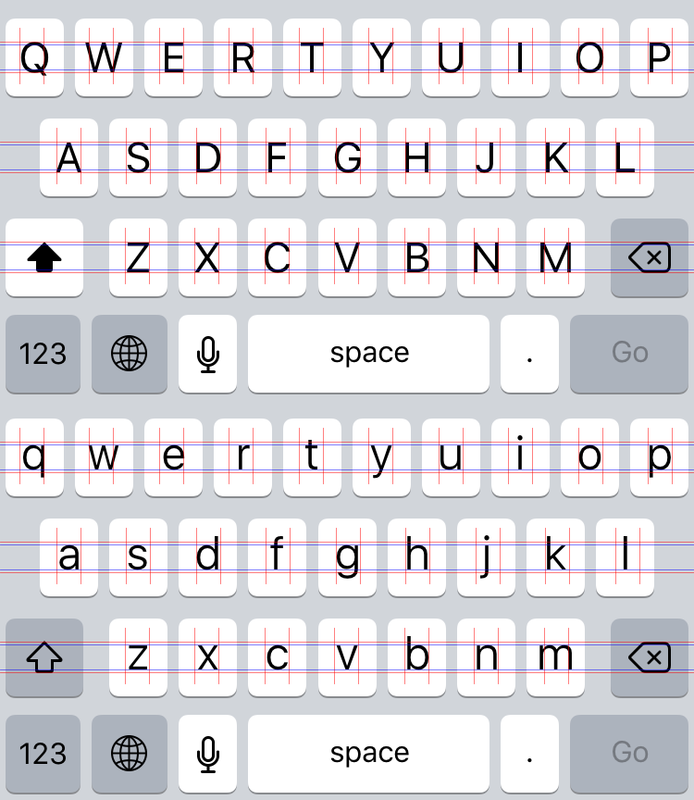 In my Processing you can press the button to swap upper and lower. The lines I tried to draw might not be perfect, but it still seemed to reinforce my intuition... in short, it feels like Apple used the centering relative to the uppercase, and sometimes that feels off. Maybe to reduce the jarring-ness of the transition when you toggle from one to the other? Characters such as "f" "t" and "y" feel especially off to me. 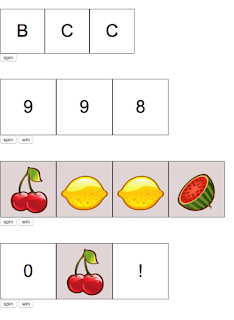 Currently a good bet (though I'm just starting with it) is https://www.ludu.co/course/ember/ - its approach of starting with a single, meat-y "real world" style example seems really promising for my learning style. One of the advantages of using a real template engine instead of just adding "magic attributes" to your HTML elements (like in Angular) is that there's a clear distinction between the markup and the logic in your templates. Man! That is kind of central for me, something that subconsciously really bugged me about angular. A lot of it comes from my strength/weakness of my long history in web development... I subconsciously map modern in-browser coding (with a library like jQuery or in some framework) to what used to happen on the server, while HTML rendering has always been HTML rendering. Angular's slamming them together as one thing never felt right to me -- similarly, JSP's "everything is a tag" had a similar semantic confusion! But some engineers love the consistency of "we can do everything in xhtml-compliant tags". I suspect that these are the people who think in nouns and capabilities, vs other folks like me who think in terms of verbs and interactions. Speaking of my strength/weakness routed in history: one thing about the "Libraries vs Frameworks" debate. I've done many, many projects over the years, but the bulk of them haven small scale, quick hit things. In most ways these are more forgiving than larger scale projects that have to be worked on by many people over a long term. I've learned from experience that coding libraries (such as jQuery) can "scale up" to handle more complex projects, and if you're thoughtful about it it doesn't even have to get too messy. I'm not yet convinced of the reverse however. When Ember pulls down 25,000 files - literally - to get to a proper "Hello,World" environment, it seems like it will never be great for things simpler than its sweet spot of power CRUD-ish apps. I've been really enjoying making my blog going though the games of COMPUTE! 's Gazette, a magazine of the 1980s for the Commodore 64 and related machines... it's so satisfying to know I can put in 30-60 minutes of work on a semi-daily basis and have something tangible and interesting to show for it. Almost addictive! The trouble is, even by 1986 standards, the UI was bad. 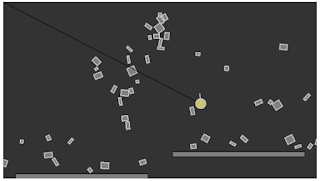 When a player's turn starts, pressing left or right on the stick selects either the square (representing place a new piece) or the arrows (representing get ready to slide a row or column) Pressing the button reverts control to that round cursor-y thing at top... the joystick moves it from square to square. 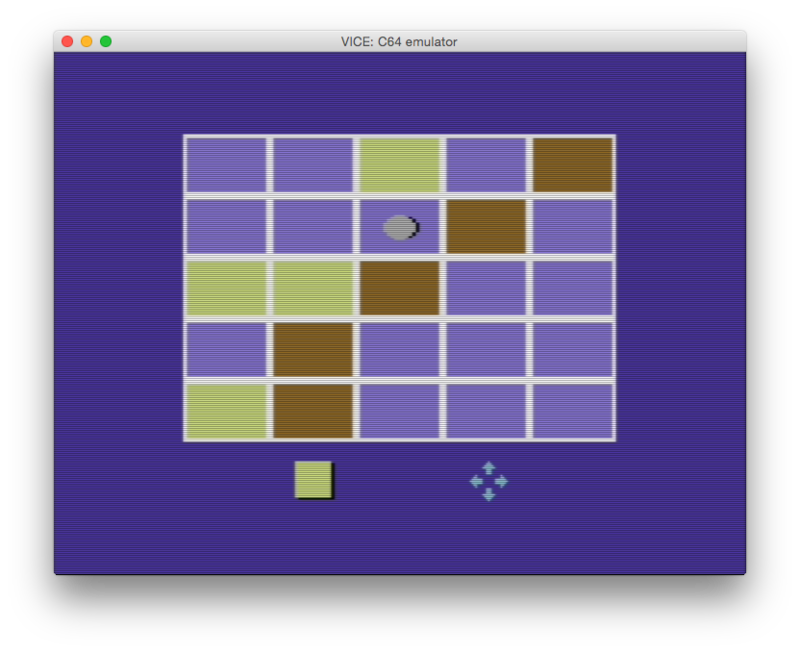 In "place" mode you press the button to claim the square, in "slide" mode you press the button and then have to press the joystick again in the way you want that square to slide (bring its row or column with it). So not only was it hard to understand (using color highlight rather than an underline or pointer or something was confusing by itself) but indicating the direction via a joystick press was unreliable, and the process was rather clunky, switch focus around and having to press the button quite a lot, considering. Players can now either click a blank square or click an arrow to indicate their intent. I doubt there anything here that couldn't be done in the Commodore 64 program - ditch the mode selector at bottom and decorate the sides with arrows, boom. I actually made this in part to see if it actually was a good game at its core... the answer is no, not really. My playtesters complained it's a bit stupid because for the first part of the game, you probably don't want to slide at all, since you lose a chance to stake out territory. 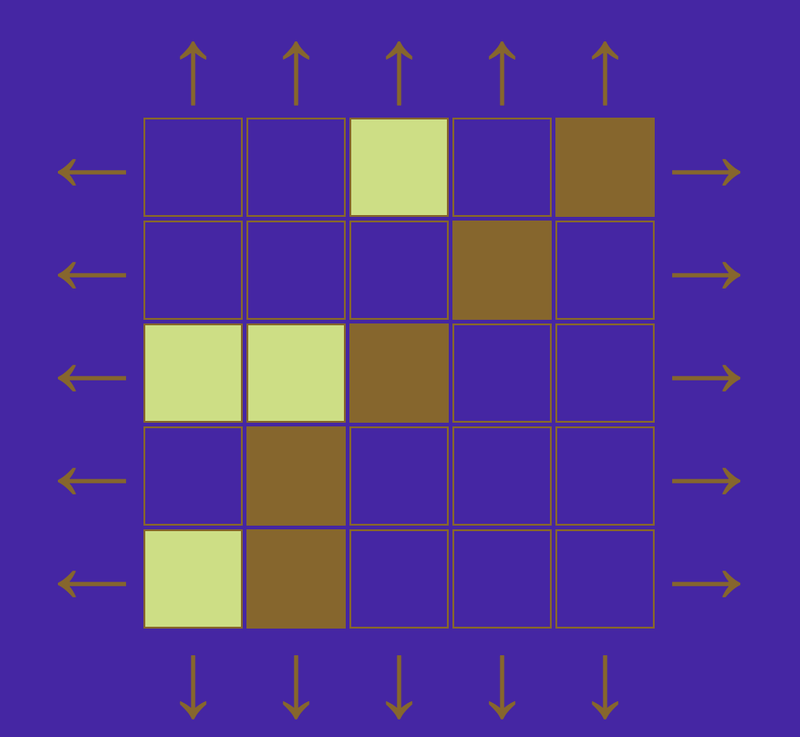 I've made this 4x4 variant incorporating their suggestion to make each turn be a placement AND a slide... this version hasn't really been playtested yet, but I'm confidant it's an improvement over the original, though I'm not sure if the whole game is redeemable. for doing recursive search and replace in the Unix shell. Before I mentioned some handlebars 101 and specifically looping... it turns out that all your variables inside a handlebars loops are local to the item you're 'on' at that point in the iteration, but if you want you can access the parent context via "../", e.g. I decided I would get in touch with my middle school self and make an Animated GIF of the thing. 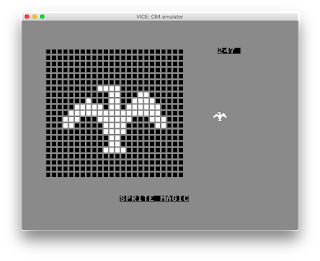 The challenge was, even when I set the Commodore emulator to not have any fake-y video artifacts, I couldn't get a pixel-perfect unaliased version of the sprite that I could just slam into ImageMagick. At this point I was able to make a second, semi-reusable program to convert the series of frames into a GIF, using the excellent GifAnimation library that is just a few clicks away from Processing's builtin Library manager. Anyway, here is the pixel plucker program "whirlybirder" and its companion whirlybirder2:Ascii2GIF. 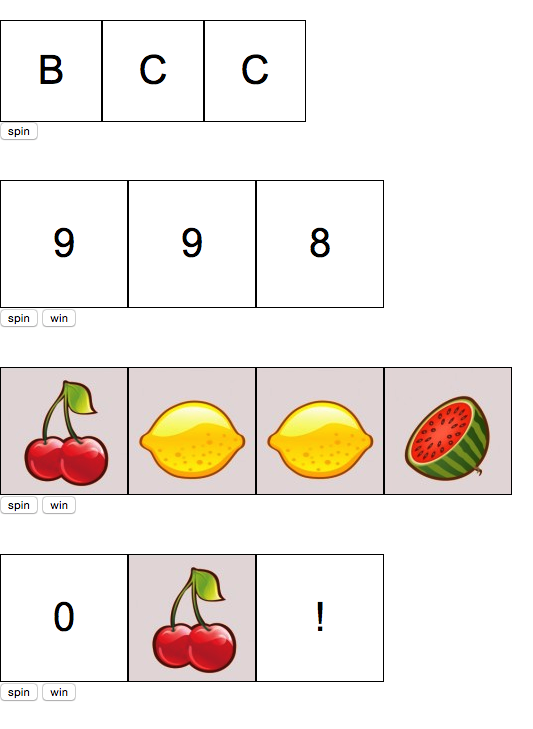 I mentioned my efforts to retool my old Processing/Java applet games and toys for the modern web. 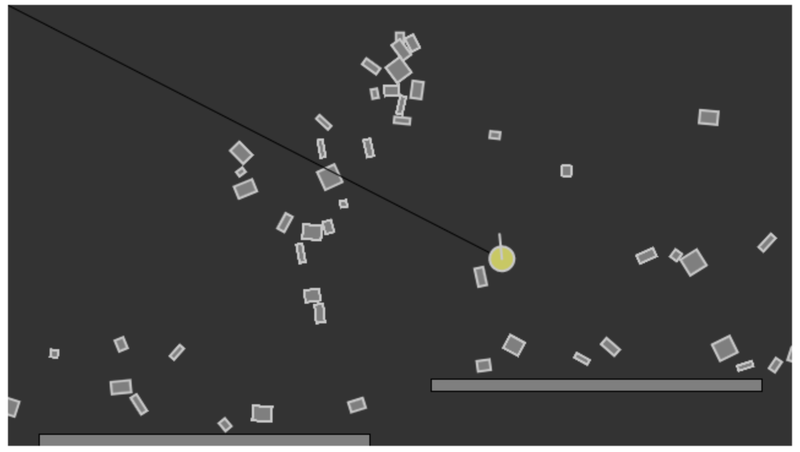 Previously I discussed patching the sound playing, but lately I took on what I think will be the toughest challenge: the few games that used physics. Back then I used JM Couillard's pphys2d library. It had a lovely set of examples and friendly syntax. Unfortunately, Processing updates a few year back rendered it inoperable, even in Java mode. Anyway, here is my Hello, World-ish program I'm linking here for my own reference. (Here's a tarball with all 5 files: beebox.tar.gz) It's almost 100% just the Chapter 5, Example 2 from Shiffman redone, except I tweaked the createWorld() helper to take an argument to disable gravity, moved some files around, and then add a bee/ball character that tries to chase the mouse a bit, but is hit by the box. Unlike the original, this may well clog up your system after running for a while, since boxes are less likely to fall into no-need-to-compute irrelevance. Also, I realized that this example skimps by not explicitly setting the bee's fixture's attributes (density, friction, restitution), so look at the "box" code for that.